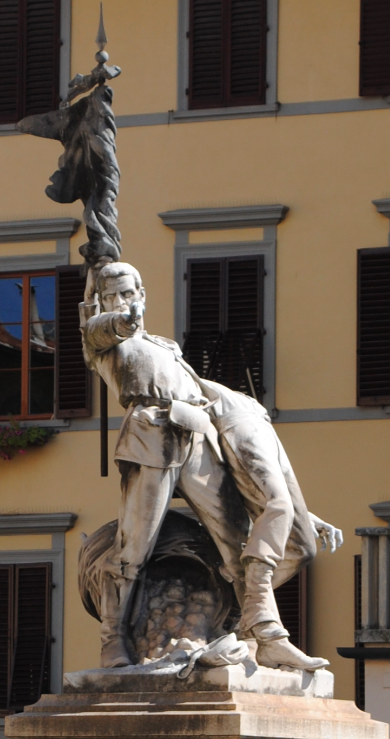 Located in Piazza Mentana Square in Florence is the monument commemorating the fallen during the Battle of Mentana. The sculpture pays tribute to the 150 volunteer freedom fighters who lost their lives in 1867 near the village of Mentana, Rome. The inscription on the front panel of the pedestal translates, “To the brave men who fell at Mentana. Consecrating Rome to free Italy.” The monument is the work of the 19th century Italian sculptor Oreste Calzolari and was inaugurated in 1902.